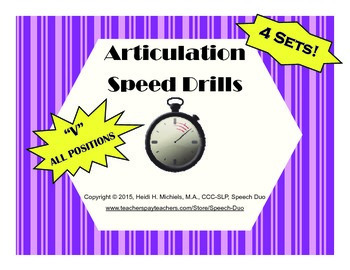 Want an easy way to motivate kiddos to improve their fluency and accuracy on articulation targets? You’re in luck! 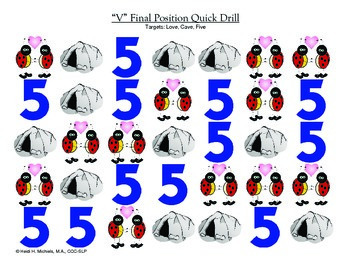 These speed drills add in a little element of healthy competition either among multiple students with similar targets or for one student across therapy sessions. Encourage students to try to beat their previous time. 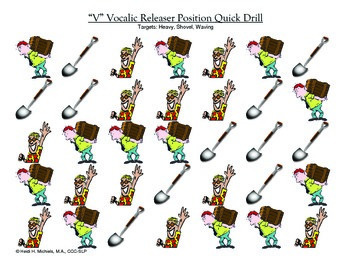 These can also be used simply as warm-ups at that start of each session. Target words are listed at the top of each page. Students are encouraged to say them as quickly as possible while maintaining accurate production. Make an error, and you have to start over (thereby increasing one’s time). The timer starts when the kiddo says the first word. 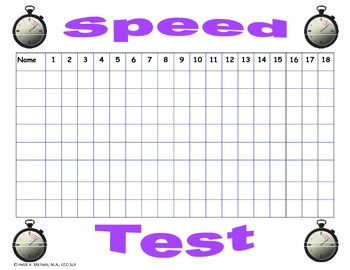 Use the included speed drill data tracking chart so students can see their progress and how they rank compared to the other students. Tracking chart is set up for recording performance twice per week. Whoever has the fastest time at the end of the 9 weeks, WINS!!! ***READY TO USE***Just print (laminate for durability) and begin using them! Thanks for checking in with the Speech Duo!